because of it’s comfort, yet durability throughout the test of time. Bestar multi-purpose stacking banquet chair is one of the most popular event chairs in the market today – and there are reasons why. If you want your guests to stay a while, Flash’s banquet chair can provide comfort to last all throughout the night. This banquet chair has an extra thick seat cushion to ensure guest comfort and is made with fire retardant foam. Bestar banquet chair can also hold up under heavy, daily use. Constructed out of 18 gauge steel with double cross bars, this chair can hold up to 500 lbs. Plastic bumper guards prevent scratching while the non-marring floor guides make this chair a safe bet for most floor surfaces. Every banquet chair by Flash Furniture is stackable, so you can easily store them away when not in use. You can also choose a color and finish option to match the décor in your event space. 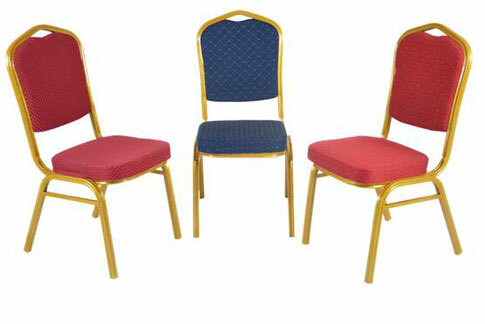 Flash Furniture’s banquet chairs are a great fit for anyone, and any place in the food service industry.